Dubai: A brainwave by the Indian team management during the 2013 ICC Champions Trophy in England resulted in the birth of the Rohit Sharma-Shikhar Dhawan combination, the country’s best in the one-day format since the retirement of the Fab Five. Five years down the line, they have emerged as the most destructive opening pair in the game, especially in sub-continental conditions, overtaking the record of century partnerships between Sachin Tendulkar and Virender Sehwag at the Dubai International Cricket Stadium on Sunday. 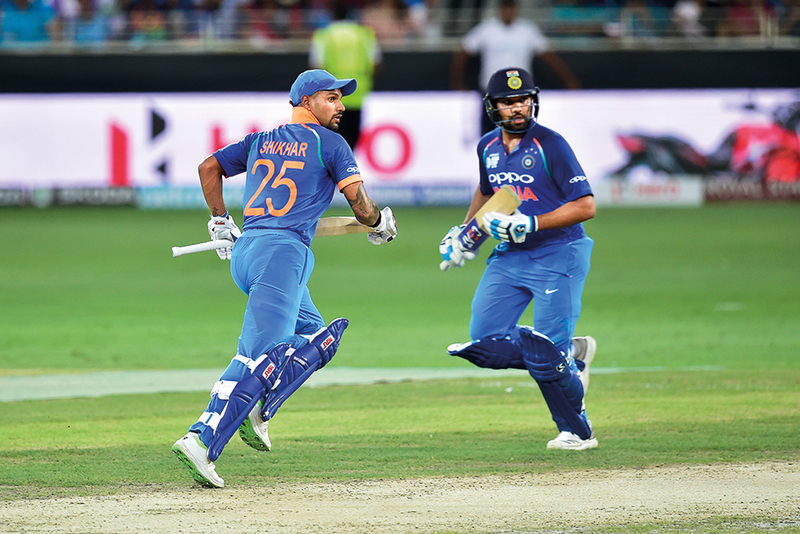 An epic 210-run partnership against Pakistan in their crucial Super Four match in the Asia Cup, which was a combination of the best of Rohit’s timing and class and Dhawan’s attacking instincts, left the bowling attack of the Champions Trophy winners groping for answers under the lights. While it piloted India to Friday’s final, it also took them past Tendulkar-Sehwag’s 12 century partnership — though it’s still quite a journey if they want to topple the alltime high figure of 21 century stands between Tendulkar and Sourav Ganguly. The synergy between the two, not exactly known for too many high fives or celebratory gestures during their stands, seems to be borne from the professionalism and the number of matches that they have played together. “It was challenging conditions, we knew it was going to be tough to come out and repeat the performance, but again I don’t want to take any credit from all the 11 players who were out on the park today,” said the stylish right-hander, whose tally of 19 centuries reflects his healthy conversion rate once he gets a half-century. For Dhawan, the two centuries so far under the demanding weather conditions in the UAE (127 vs Hong Kong; 114 vs Pakistan) is expected to take some weight off his shoulders after an abysmal outing against the likes of James Anderson and Stuart Broad in the Test series in England. The Tendulkar-Ganguly combination still towers over the likes of the unstoppable duo of Adam Gilchrist and Matthew Hayden or Gordon Greenidge and Desmond Haynes in terms of figures, though the Caribbean stalwarts boast of the best average (52.55) and still remain in third position of the list of most successful openers even two decades after they retired. Rohit and Dhawan, who are now fourth in terms of century partnerships and seventh in terms of overall runs, are expected to overhaul the total of 3,919 runs made by Tendulkar and Sehwag as they are only 73 runs away with two matches still to go, including the final. It will be interesting to find out if Ravi Shastri decides to rest at least one of them in the inconsequential group game against Afghanistan on Tuesday. It’s been a curious case for Rohit Sharma, who despite a giant in the white-ball game for India, has never been a regular for them in Tests.